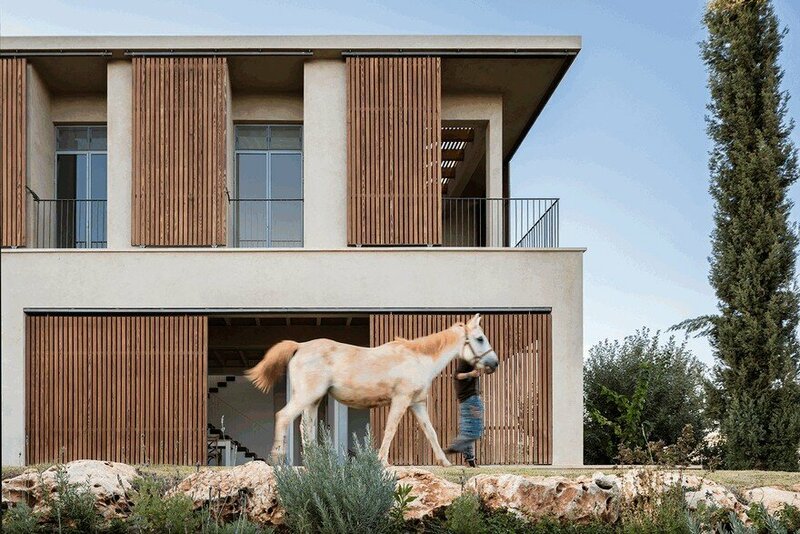 When Golany Architects approached the design of this Galilee house, they took upon themselves the challenge of maximizing the potential of the lot at the edge of a village, overlooking the open wide landscape, adorned by the Sea of Galilee. 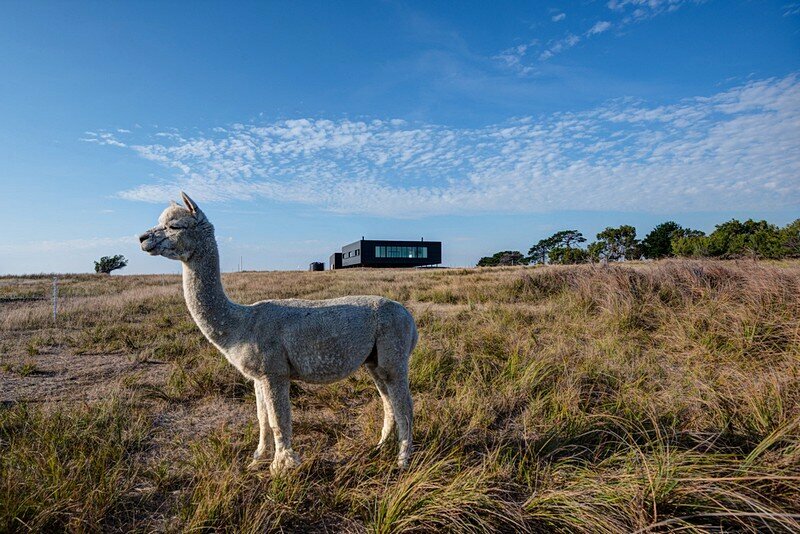 The desire was for the residence to embrace and engage with the ancient landscape. 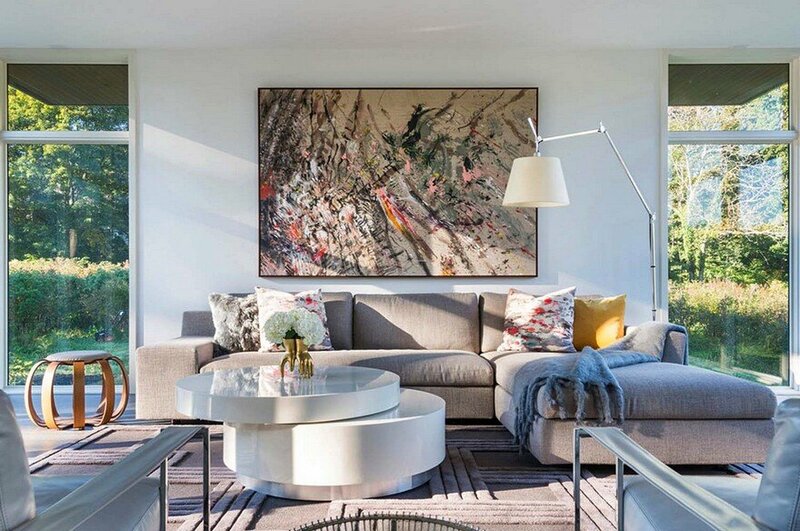 Therefore, it was important to maintain an unobstructed continuity between the lot and its surroundings. 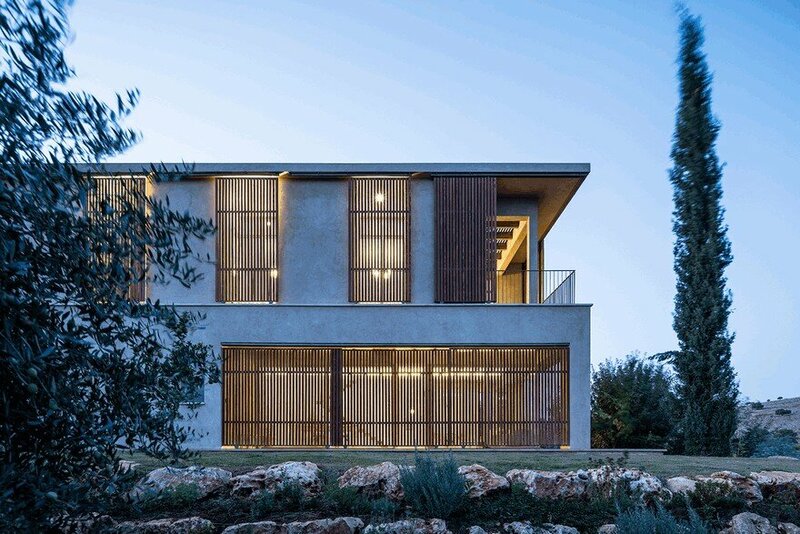 To determine the exact level of the house, the architects and clients went to the empty lot, where they climbed a ladder to check for the level at which the Sea of Galilee can first be seen. 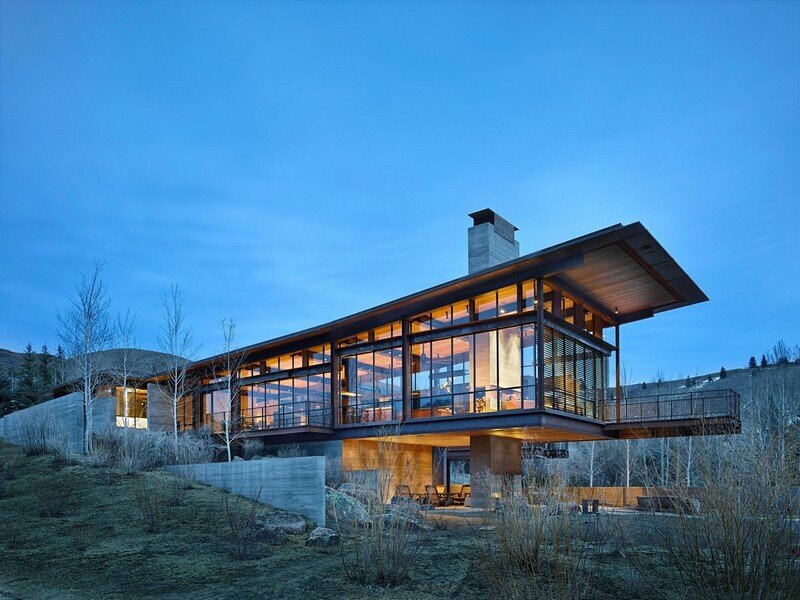 The level of the house was then carefully determined for a minimal rise above ground level to provide far views, while still avoiding any retaining walls or barriers, despite the mountainous terrain. 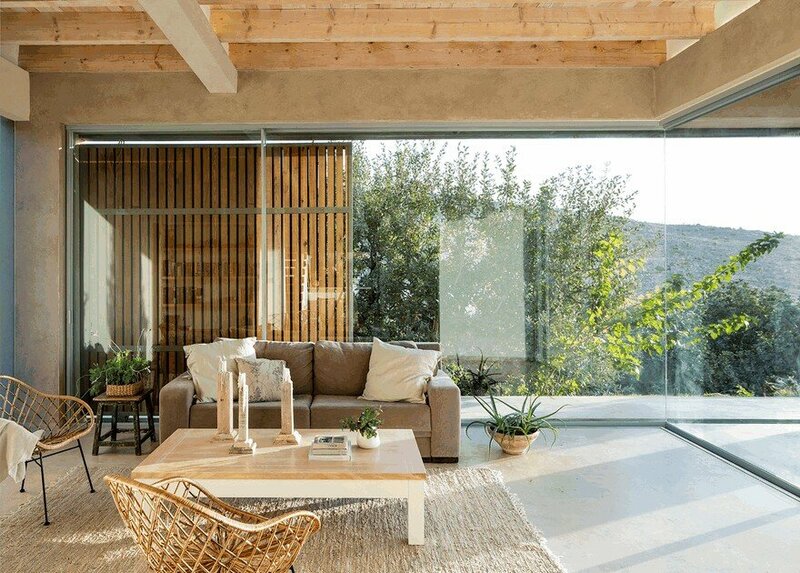 The living areas which are located on the ground level, are continued by the garden that seems to extend towards the horizon, through the fields, and all the way to the Sea of Galilee. 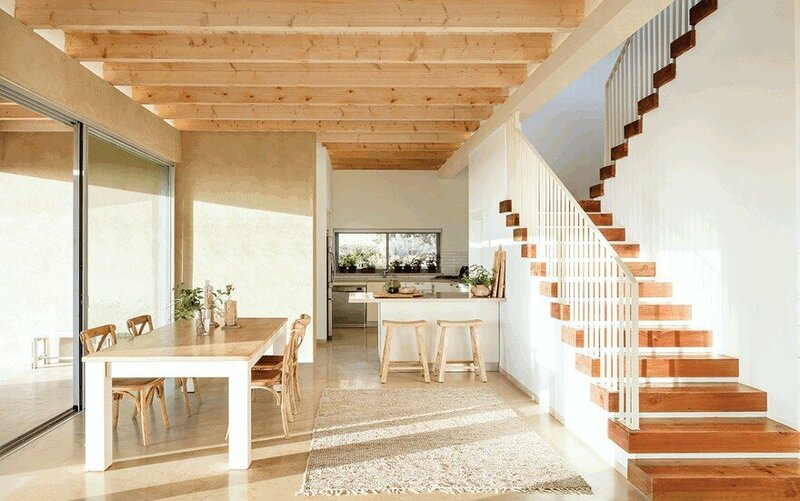 The actual size of the lot is only 500 sqm, so in order to leave enough living outdoor area, the house was split into two floors. 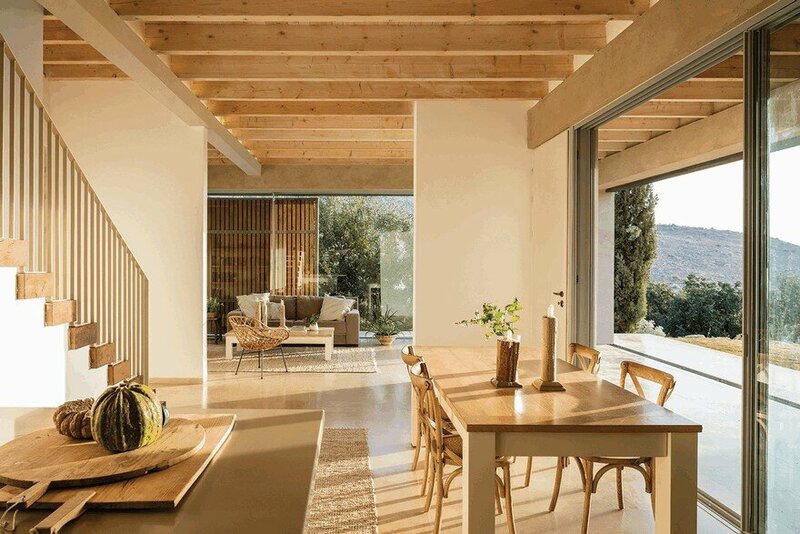 The bedrooms and family room, adjoined with a pergola covered terrace, are on the first floor, where they are open to the sweeping view above the treetops. 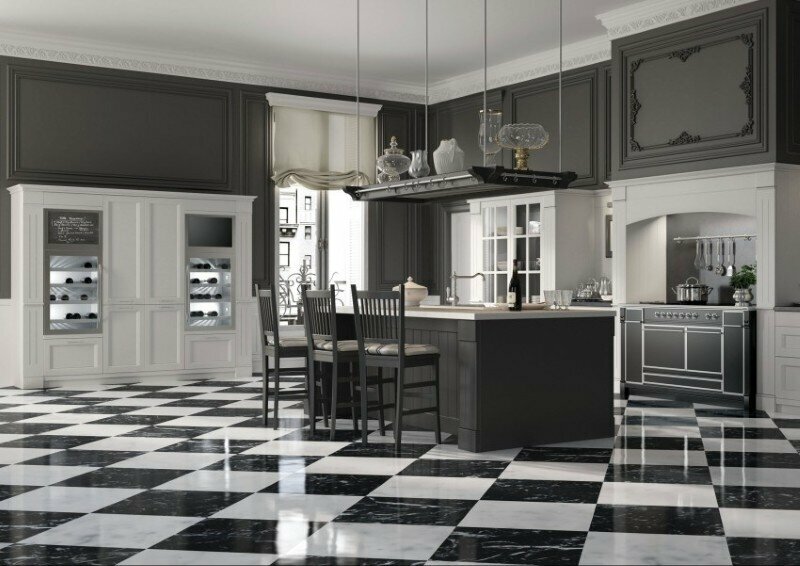 Sustainable and environmental considerations were taken into account. 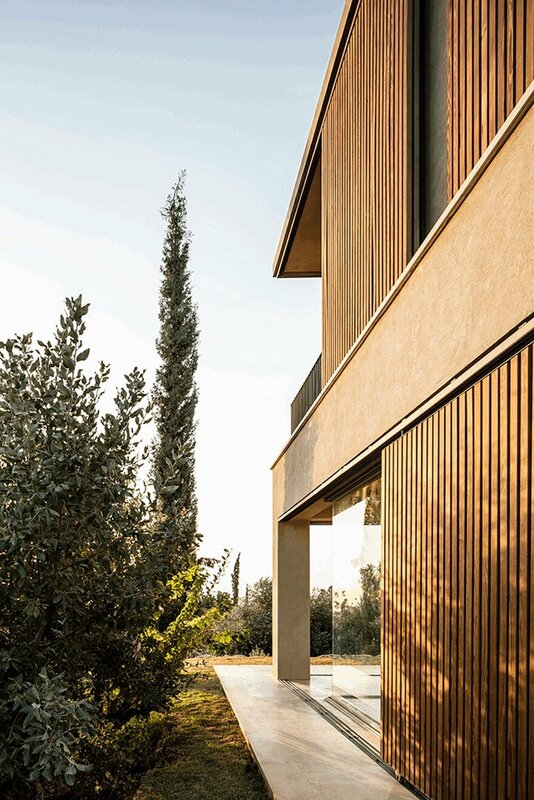 The generous openings facing the view to the south and east, require the provision of shading and filtering against the intense sun, which is provided by the wooden shutters. 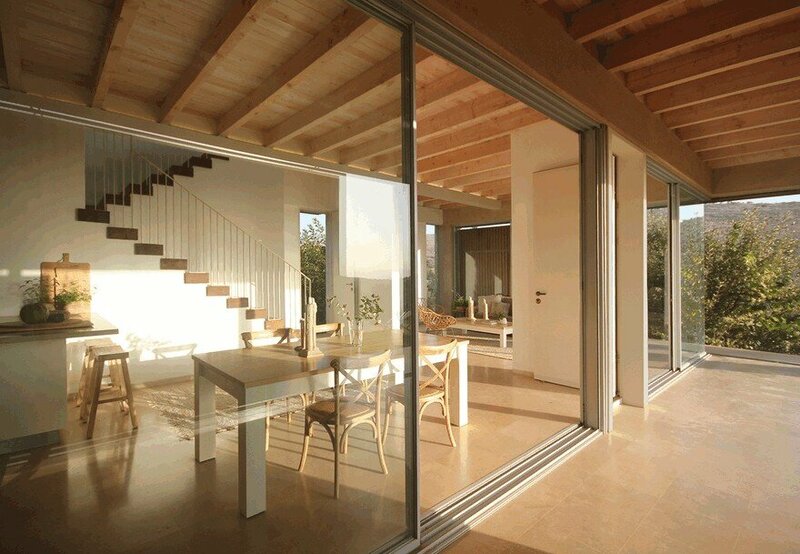 The shutters slide in adjustment to the position of the sun. 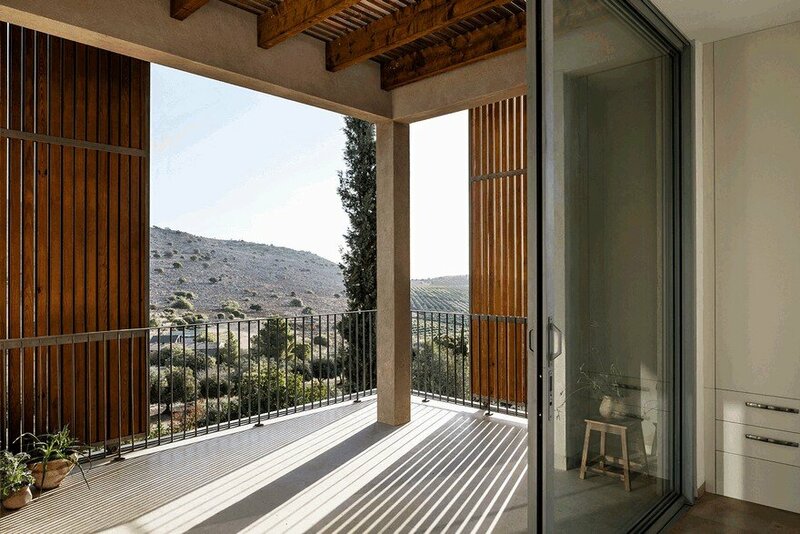 The shutter lattices, as typical of Mediterranean mashrabiya, block views inwards and maintain privacy, while allowing one to enjoy the scenery from the inside. 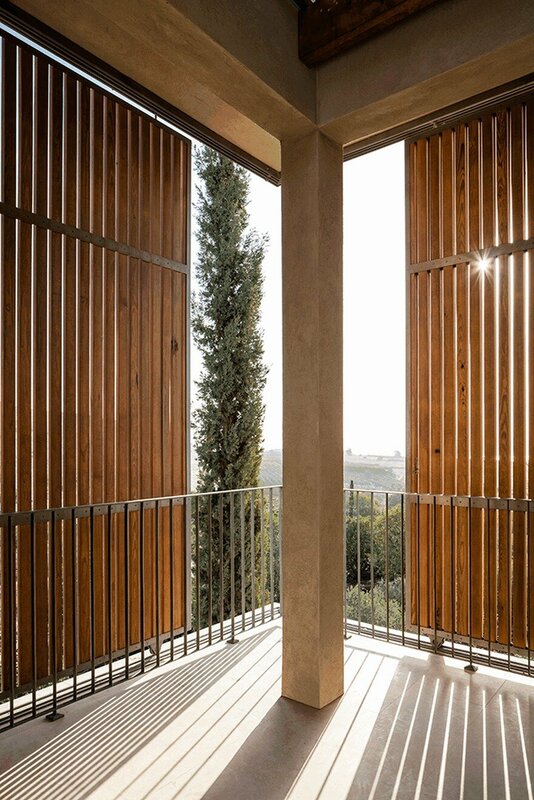 The light rays penetrating through the slits create a magical, ever-changing atmosphere in the interior anytime the sun illuminates the shutters. 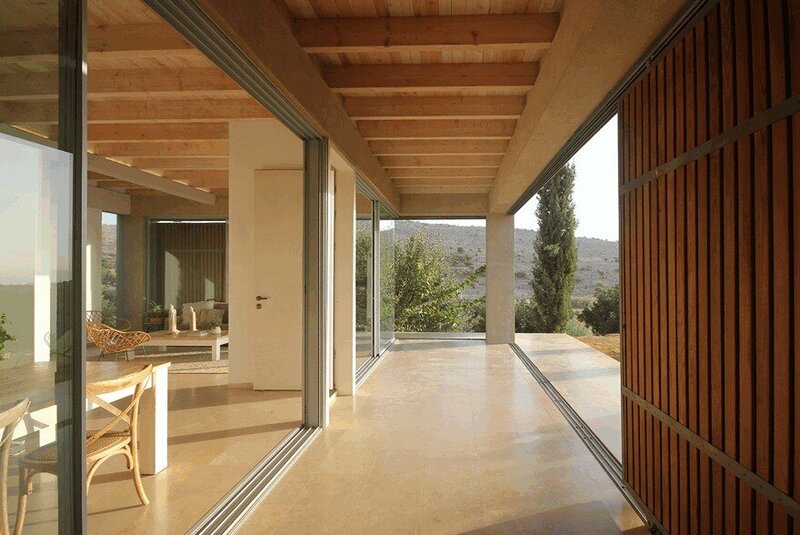 The large windows and doors on both levels of the house are recessed from the shutters’ outer façade. 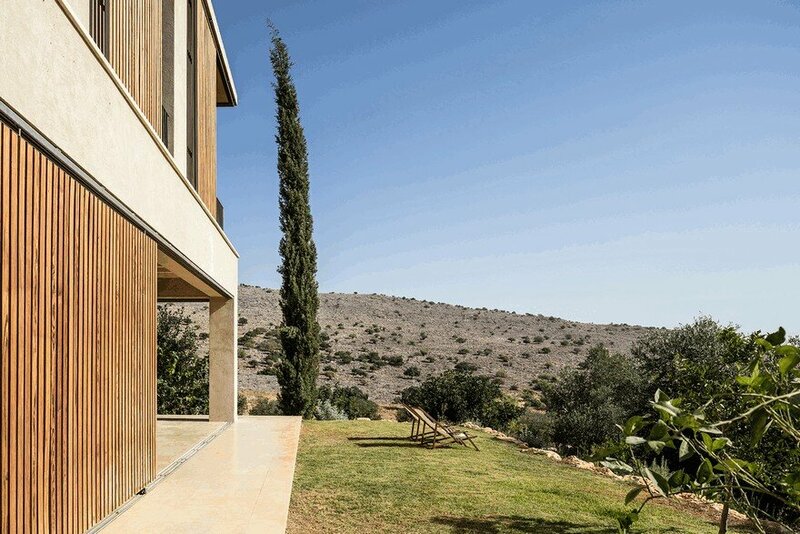 The double-skin envelope, created that way, significantly improves the climate control of the house and thus – as the clients indicated – despite the heavy heat, typical to this region of the Jordan Valley slopes, the house stays cool and pleasant even during the hottest days of summer. 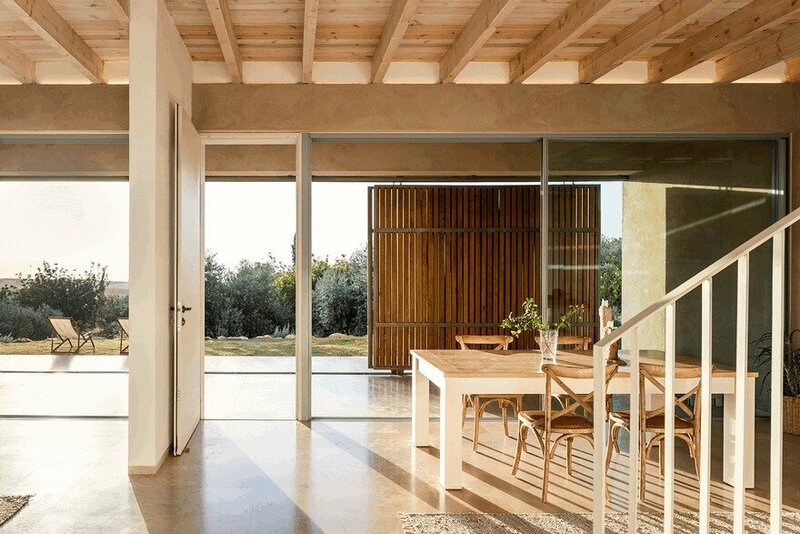 Between the glazed doors and the shutters, intermediate spaces are created – kind of outdoor rooms – enabling to sit outside in the fresh country air while still maintaining the privacy and intimacy of the inside. 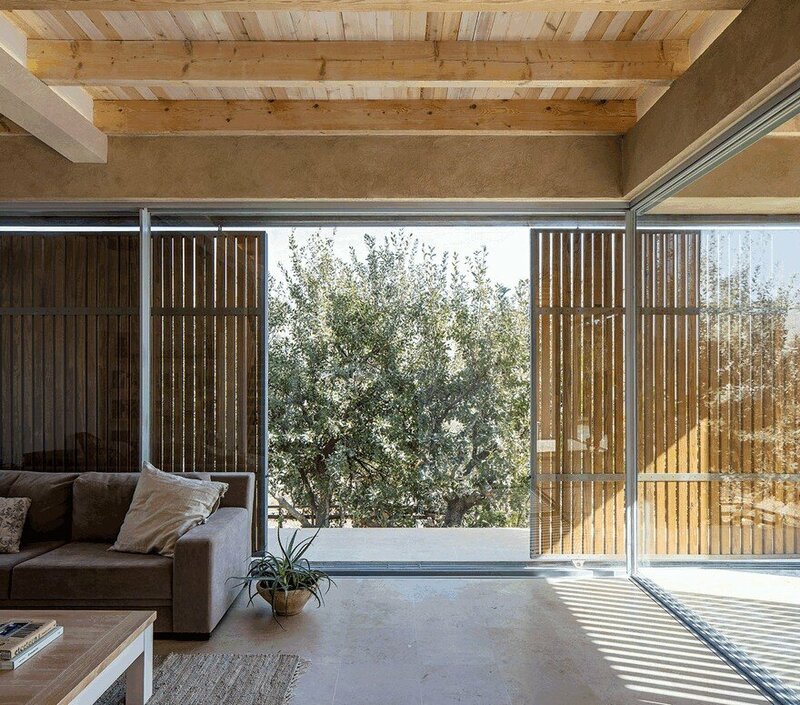 The intermediate spaces can be closed by the wooden shutters, rendering it an integral part of the interior, while at the same time being outdoors. 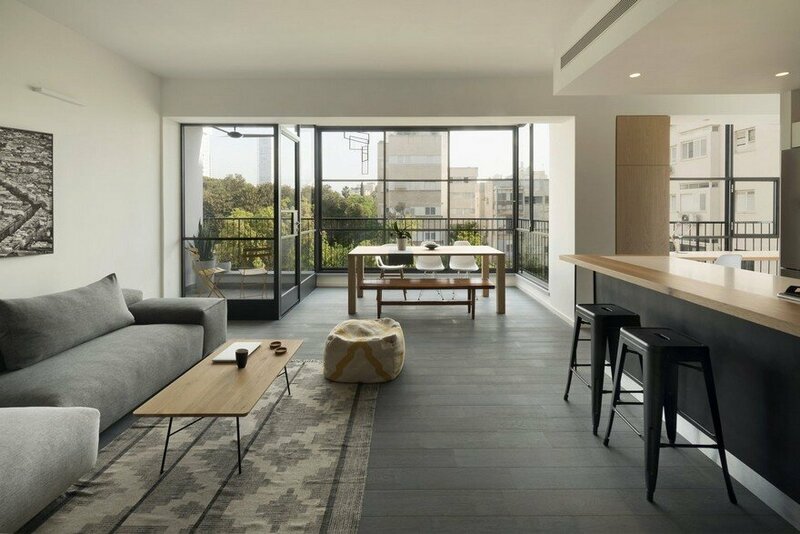 At the ground level, the covered balcony that serves as an outdoor living room extends the living and dining areas, while an indoor-outdoor balcony on the first floor extends the family room. 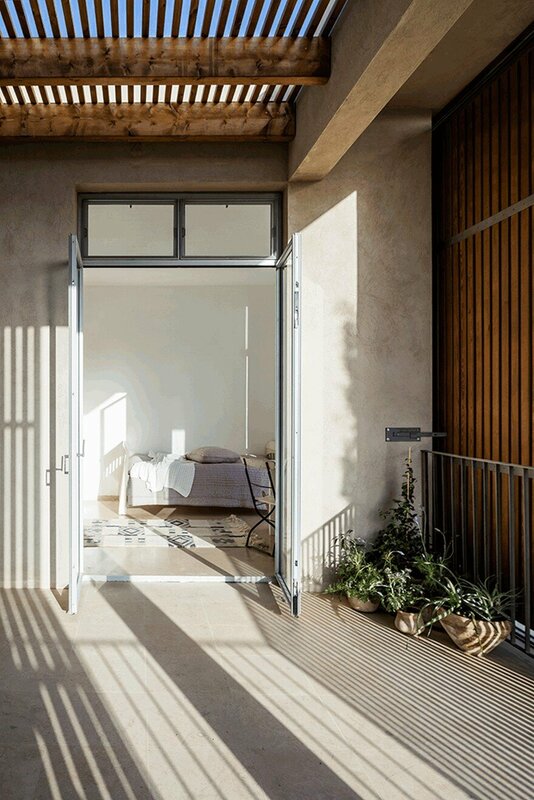 In the bedrooms, between the two layers of the house envelope – the windows and the shutters – small balconies are created. 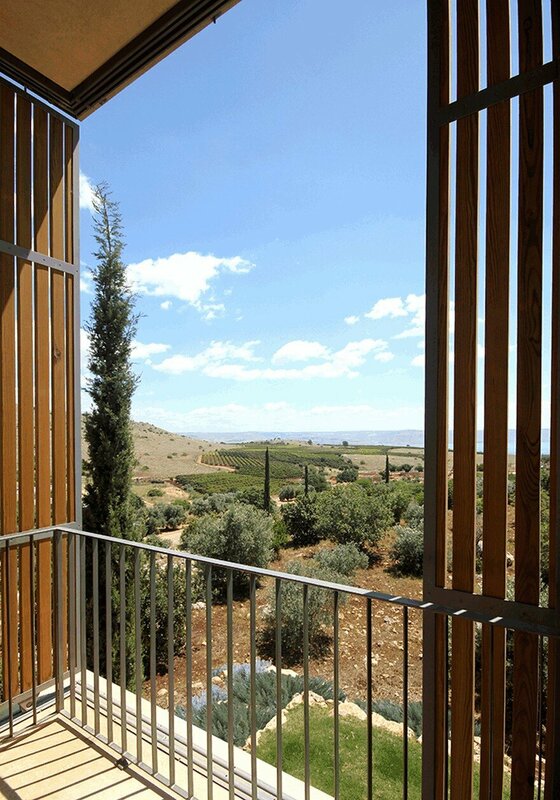 The balconies, with their vertical proportions – as a contemporary interpretation of the traditional balcony – provide unobstructed continuity of the close view (the private garden), mid view (the village fields) and far view (the Sea of Galilee and the Golan Heights). 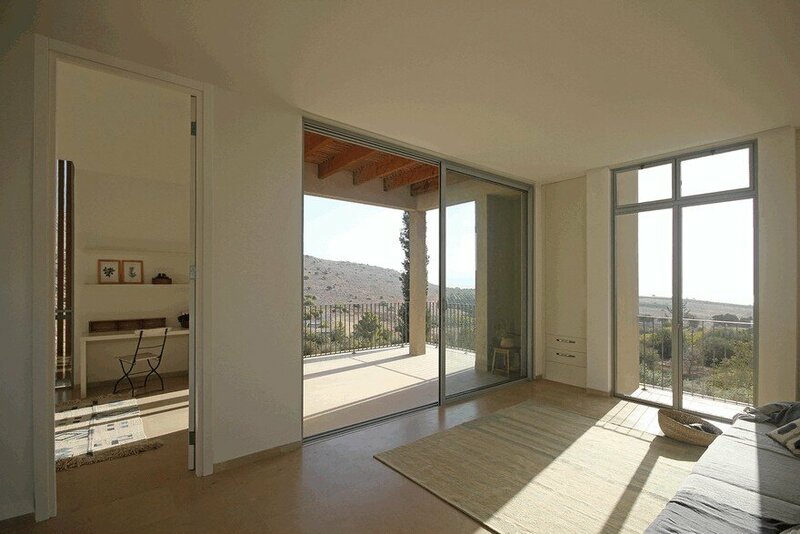 Carefully positioned openings on the rear elevations also capture views of Mount Canaan and the old town of Safed. 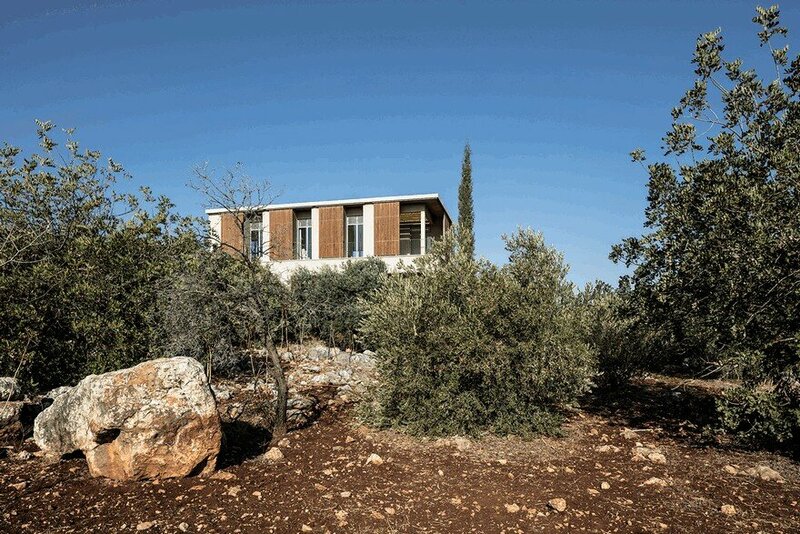 The Galilee house aims to integrate into the pastoral surroundings. 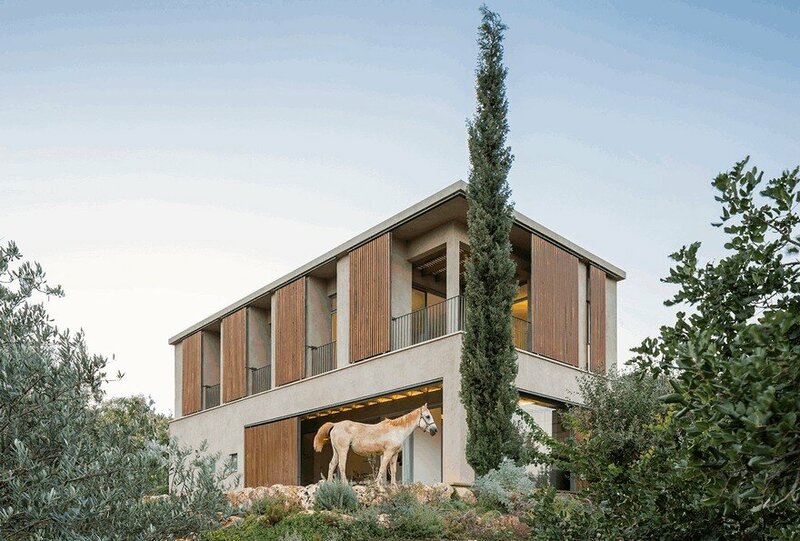 The yellowish-brown ridge at the front, the rugged soil and the Olive and Carob groves around it where horses graze, led to the choice of the materials: matching colors for the cement textured plaster and the timber shutters outside, light brown stone for the paving inside, and the wooden ceiling with its massive beams. The cypress tree at the corner of the lot, the oak tree by the living room window and other mature trees were preserved during construction, and the house was built among them. 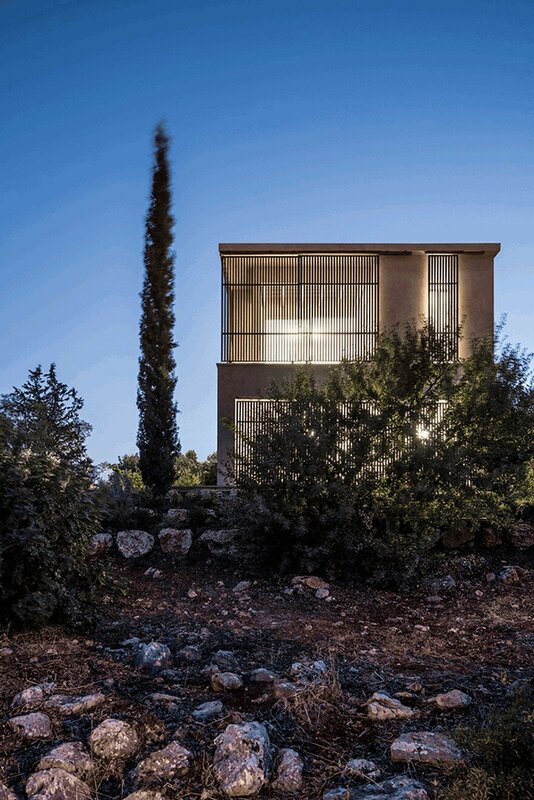 Amid the rocks, rosemary, lavender and spice plants with local fragrance were planted. 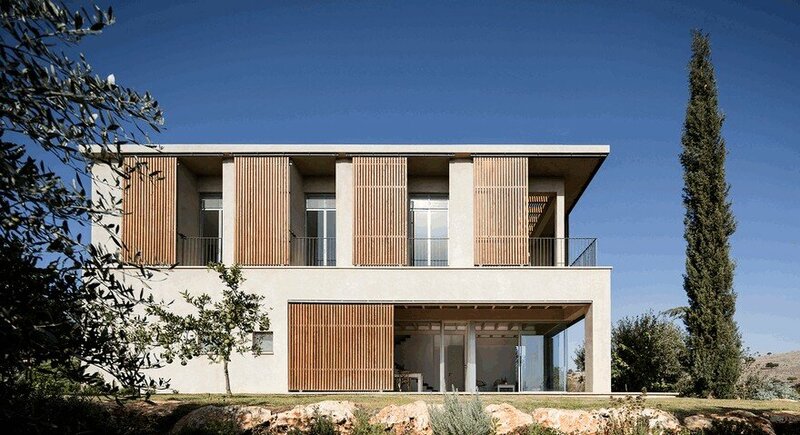 The Galilee house was designed to capture the ambiance of the environment and was built out of elements that originate from it.